Identification: Upperside is red-brown with dark, distinct borders and yellow, chevron-shaped submarginal spots. 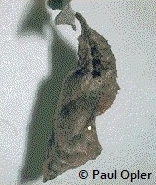 Underside is blackish-gray; silver mark at center of hindwing is L-shaped. Life History: Males perch on shrubs in valley bottoms during the afternoons to wait for females. 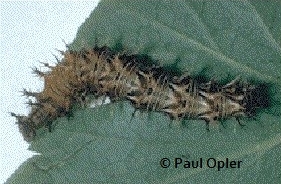 Eggs are laid singly under host plant leaves; caterpillars eat leaves and rest under them or on stems. Adults hibernate. 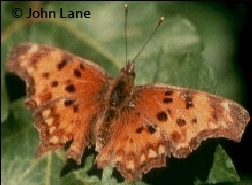 Flight: Overwintered adults emerge in May, mate, and lay eggs of the next generation, which flies from June-October. Caterpillar Hosts: Gooseberries (Ribes species); perhaps others. Adult Food: Tree sap, rotting fruit, rarely flower nectar. Habitat: Coastal canyons, streamsides, redwood forests. Range: British Columbia south through eastern Washington and eastern Oregon and along the Pacific Slope to central California; southeast through the northern Rockies to southern Wyoming, Colorado, and Utah. Conservation: Not thought to be of concern.